Being a young scholar in higher education has come with its own set of challenges for Dr. Nicholas D. Hartlep, an associate professor of urban education and the chair of the early childhood and elementary education department at Metropolitan State University. Across the years, Hartlep has felt judged by those who have told him that he “ascended pretty fast” within his career. At 34, he also believes that his age has also been a stumblingblock. Before becoming a professor, Hartlep taught in public schools for three years in Minnesota and Wisconsin. He also briefly taught abroad in Quito, Ecuador upon completing his undergraduate degree at Winona State University. Hartlep returned to his alma mater to earn a master’s degree. While working on his degree, he was a long-term substitute teacher, teaching high school Spanish and middle school math and social studies. Not too long after, Hartlep made the transition from K-12 to higher education, securing an assistant professorship at Illinois State University immediately after graduating with a Ph.D. in urban education and social foundations of urban education from the University of Wisconsin-Milwaukee at the age of 28. But with his research focus in urban education, Hartlep felt detached by the rural geographic location of Illinois State. After teaching at Illinois State for three years, Hartlep moved to Metropolitan State because of its geographic location, the school’s reputation and focus on urban education. “[Metropolitan State’s] faculty are diverse,” says Hartlep. “We are a minority-serving institution and so I thought, ‘this is who I was trained to serve and this is who I want to help and work with,’” he adds. At Metropolitan State, Hartlep teaches multicultural education, methods courses and mathematics for elementary teachers. In addition, he is seen as a rising star, having published dozens of articles on a variety of topics, such as transracial identity development. Hartlep’s interest in urban education stemmed from his childhood experiences. Born in Korea, he was adopted by American parents and was raised in Green Bay, Wisconsin. Hartlep found that being raised in an adopted family was difficult and describes his relationship with his parents as “not healthy.” Still, “what’s great is you know, when I share my identity with folks in the classroom, I’ve cultivated some good relationships with adopted students of mine at Metro. State and also Illinois State,” he says. Throughout his career, Hartlep has been recognized with several awards, including the John Saltmarsh Award for Emerging Leaders in Civic Engagement and the University Research Initiative Award. 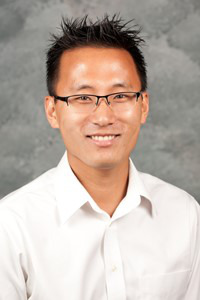 In addition, he has written multiple books, including his most recent one, Asian American Scholars of Education: 21st Century Pedagogies, Perspectives and Experiences, which will be published in September. Hartlep says that he hopes to earn full-professorship some day and aspires to eventually become a college dean. As he has navigated his career, he says that his wife and three children have remained important to him. This article appeared in the August 23, 2018 edition of Diverse.